We all eat. But even if the goal is merely survival, food means different things to different people. It could be fond memories of a lazy Sunday breakfast or brunch with friends. A special event when food and drink was involved (isn’t it always! ), or just the thought of a future meal and the anticipation that it may bring. 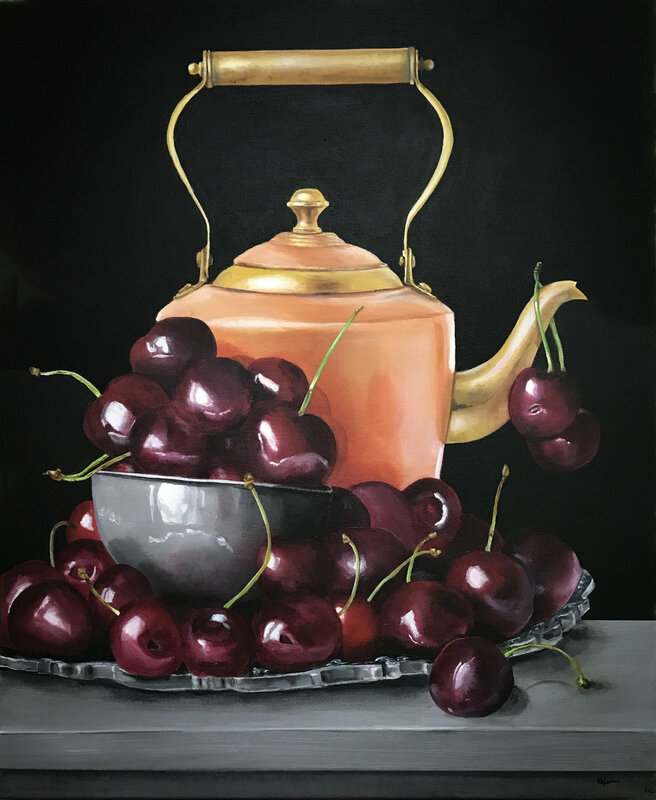 Whatever the reason, painting images of food and drink makes Robin Harris happy, and she shows it through larger than life acrylic on canvas paintings — the bigger, the brighter, the better! Unusual food pairings and complementary liquids are featured, with the focus on movement and flow through splashes and drips and even an ooze or two. Harris especially enjoys creating metaphorical compositions fusing disparate and often contrasting elements with subtle humor to provide occasionally startling insights into everyday life. She created Harris Design Inc. (an advertising, marketing and graphic design) nearly 30 years ago, but now spends her time painting. Her graphic design background has been extremely helpful in creating these unexpected compositions. Harris is a contemporary realist painter with a twist. Through the use of positive and negative space, motion and subject matter she explores infinite possibilities of gastronomic whimsy. Her goal is to completely capture the viewer/audience’s attention enough that they become caught up in the moment, sufficiently engaged such that they “see” or complete the motion and its results, filling in the gaps in actual perception without having to concretely visualize the final result itself. In other words, the viewer becomes a very real part of the process of creating or eliciting an emotional response. As she has come to realize over the years, engagement is itself the definition of art.